FUELAB TOTAL Fuel System Package FORD - Dezod Motorsports Inc - Home of the automotive performance enthusiast since 2002. The FUELAB TOTAL Fuel System Package provides all that you need to retrofit your vehicle with a superior rock-steady pressure return-style fuel system that supports up to 1800HP, and is for developed for racing and street use. With these kits you can reduce time and guess work that are normally associated with extensive vehicle fuel system modifications. The FUELAB TOTAL Fuel System Package is based on the drop in style FUELAB Power Module which features a brushless motor for long-life and reliability. The pump works in tandem with the most intelligent and award winning regulator on the market, the FUELAB Electronic Regulator, bringing high flow capacity with automatic demand speed control. The FUELAB 529xx Series electronic regulator automatically controls the FUELAB pump to minimize operation based on actual measured fuel demand. This keeps the fuel cooler, and helps to avoid vapor lock and cavitation damage. No programming, calibration or additional control boxes are required. The FUELAB TOTAL Fuel System Package allows a direct installation of the FUELAB Power Module fuel pump into the OE Mustang’s fuel tank using a FUELAB Power Module Installation Kit. No cutting, fabrication, or expensive multi-hangar systems with multiple wires and tees are required. The unit seals with the tank’s factory O-ring and lock ring. The kit includes a pick up with an integrated 75 micron stainless steel filter sock. A billet Jet Pump that allows direct plug-in to the factory’s internal plumbing. This system draws fuel from the passenger side portion of the saddle tank. The FUELAB system allows use of the original OE module’s sub-components for the fuel tank fuel level sensor and connector that easily swap over. The system also includes an approved Electrical Installation Kit, all plumbing from the OE fuel tank to your aftermarket -8AN fuel rails (not included in this kit), and a FUELAB high performance In-Line Fuel Filter, for a complete return style AN Billet Fuel System. 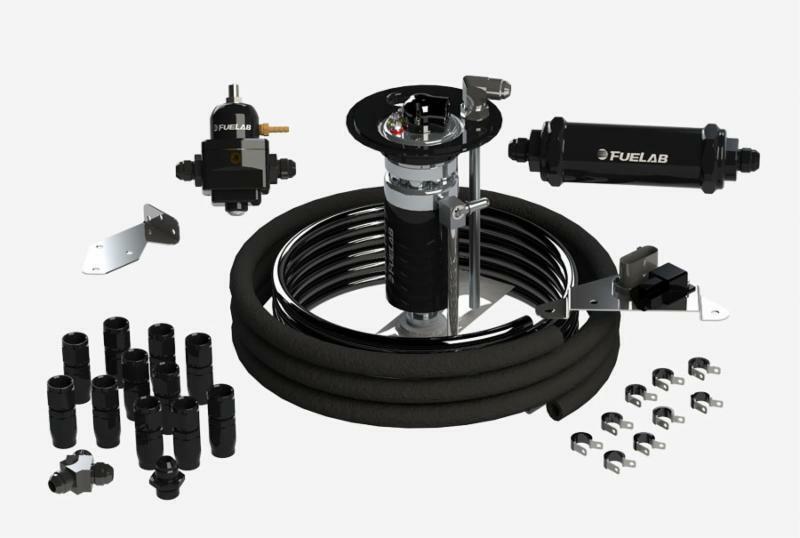 The FUELAB TOTAL Fuel System Package provides for easier fuel system modification and installation without the hassles of sourcing wiring, relay, fuel lines and attachment clamps. Software changes are required for ECM to switch to “Return Style Fuel System” from the original “Return-less Style Fuel System” setting. Note: For those not needing the complete TOTAL Fuel System Package, individual components are available. Including In-Tank Power Modules, Power Module Installation Kits, and Plumbing and Electrical Installation Kits.